Click through for scoring info. Entry No. 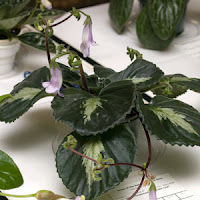 391, Chirita latifolia, exhibited by Richard G. Carr. Score: 93. First Place. Entry No. 306, Chirita brassicoides 'Marble Leaf', exhibited by Paul Kroll. Score: 89. Second Place.